Depersonalization is primarily brought on through stress. When you go through stress, your body produces adrenaline and cortisol, the primary stress hormones. These hormones act on your nervous system and can produce feelings of anxiety, panic, and also depersonalization and derealization. Consequently, reduction in stress can bring the alleviation of depersonalization feelings and symptoms. Are depersonalization and derealization the same? Depersonalization and derealization are dissociative disorders. They almost always occur together (they are said to be comorbid), but they differ in their experience. Depersonalization (DP) makes you feel as if you are a stranger to yourself. People often report that they feel like they are watching a movie about themselves. They may have trouble recognizing themselves in the mirror. Derealization (DR), on the other hand, is a disconnection with outside reality. People going through DR might experience the world as dreamlike. Perceptual distortions, like an increase in the brightness of the outside world, are common in DR.
Depersonalization disorder is said to be the third most common mental illness after depression and anxiety. Almost 50-70% of the world’s population tends to experience an episode of depersonalization at least once in their life. Such episodes are usually brief and can last anywhere between a few minutes to a few hours. Around two percent of the world’s population experiences DP chronically. Their experiences can last from weeks to months to sometimes even years. It should be noted that through proper training and recovery work, people can work their way out of chronic depersonalization. 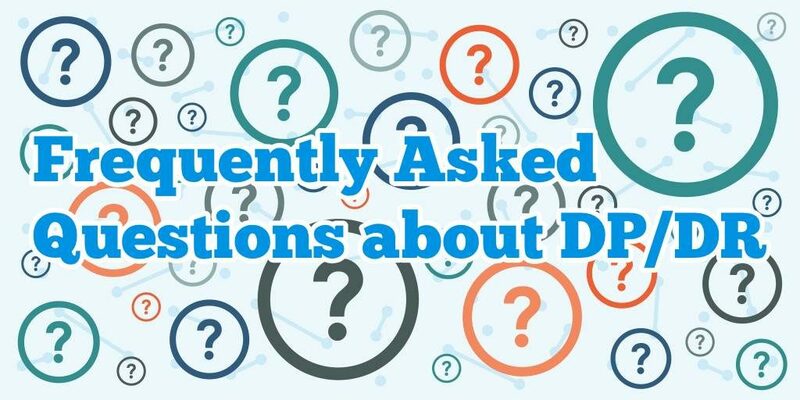 What are some of the major symptoms of DP? Reality may seem dreamlike or unreal. Disconnection from memories and the past. Excessively concerned with existential questions like, “Why am I here? How do I exist? Is existence real or is it a dream? Experiencing somatic symptoms like a blunt pressure on the forehead, general dizziness, weightlessness in hands and legs, tightness in the chest. Perceptual alterations like visual snow or a halo around lights. Can depersonalization make you dizzy? DP does seem to have an effect on the sense of balance. An increase in the intensity of DP can lead one to believe that they may faint or lose their balance. DP is a disorienting disorder. You can sometimes feel like you are walking sideways or feel like you are hovering over the floor even when you are clearly grounded. Can depersonalization be cured/go away? The short answer is a resounding YES! In reality, it does take time and effort to heal and recover from depersonalization. Recovery lies in first understanding what is happening to oneself. Then we need to accept the symptoms of DP and not fight them. And finally, we need to make changes and straighten out the imbalances in our lives. Can depersonalization be caused by weed (marijuana)? A great number of people experience depersonalization after an adverse reaction with weed. Many teenagers and even some adults try marijuana for the first time and end up not liking its psychoactive effects. They may feel the symptoms of DP or feel like losing control, which can cause them to have a panic attack. After that, some people tend to experience DP chronically. It’s important to note that it’s not the marijuana that caused their DP. Rather the weed acted as a trigger in causing them to have a panic attack. Such an experience can be traumatic, hence the depersonalization is brought on due to this sudden onset of trauma. Can depersonalization go away and then come back? Recovering from depersonalization is never a straight line. Almost everyone experiences setbacks during recovery. Some days we may feel fine and feel like recovery is just around the corner only to get hit with a bout of DP a week later. This is fairly common and should not be a cause of worry. Accept these setbacks and keep moving forward in your recovery journey. Sometimes, even after being free of DP, one may encounter DP many years later if their life has become stressful. DP is a product of the stress mechanism and hence an increase in the general stress that one feels can bring on DP. One should not worry about this but instead, look at ways to mitigate the underlying stress. Once the stress has been busted, the DP will simply dissipate over time. Is there a link between depersonalization and depression? People who experience depersonalization often experience bouts of depression as well. I am not sure if there is a biological connection between the two illnesses, but to me, they seem psychologically related. When someone goes through DP, it can often feel debilitating. People often wonder how long they are going to be stuck with DP. This can lead to feelings of hopelessness. From there, it’s easy to get into a depressive mode of thinking where we are battered by self-defeating thoughts. Believing in such thoughts only further strengths their hold on us. Sometimes a change in behavior can break the depressive thought cycle. Exercising and following a routine can help stave off such thoughts. Also, support from family and friends can be helpful. Some people benefit from antidepressant medications as well. Can depersonalization lead to psychosis? It’s very uncommon for depersonalization to lead to psychosis. Psychosis is often characterized by a complete break with consensus reality (the reality that everyone experiences). When someone is going through psychosis, they are fraught with delusions which they are unable to recognize as false. People get caught up in their own fallacies and can’t seem to find their way out of them without external help. On the contrary, people who go through depersonalization are aware of their struggle. Though they experience their self and their reality in a way that is different from before, they are aware of this. People who go through DP do not develop delusions about themselves or the world around them. They may feel confused about what they are going through, but with the right support and guidance, they can reach recovery. This is a very big fear of people who become depersonalized. In short, the answer is no. I’ve written at length about this topic, please see this article of mine. Can depersonalization cause memory loss? Depersonalization does seem to affect memory and concentration. Because one is unable to be fully focused on the present moment, it can be hard to remember what might have just happened. If you are preoccupied with DP most of the time, you don’t really pay attention to whether you have brushed your teeth or eaten lunch or taken care of chores. Memory recall also seems to be affected by DP. Past memories can sometimes have a dreamlike quality associated with them. It can sometimes be hard to tell whether recollection of an event is a past memory of something that actually happened or whether it was just a dream. 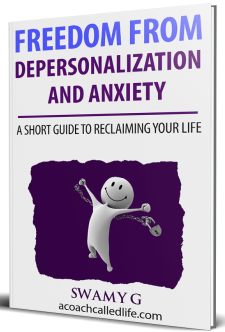 Though depersonalization can last for a long time for some people, it is not permanent. Remember, just like your body knows how to heal itself, the mind also possesses the ability to repair itself. If you follow the guidelines outlined on this site (understanding, acceptance, and action), you can definitely find yourself on the path to recovery. Why is depersonalization worse in the morning when I wake up? This is common amongst most DP sufferers. Many people feel like the intensity of DP is highest just after they wake up. It can partly be due to the fact that when we wake up, our internal system is just starting up and getting adjusted to the day. As we go on, it stabilizes and you may feel less depersonalized. Another reason could be psychological. When we wake up, we realize that we have a whole day in front of us. We are not sure what might happen during the day ahead. We are worried about how to pass this day. We worry whether we’ll have a panic attack or become derealized and get confused. We think about the meetings, the chores, and all the work we will need to do while being depersonalized. All of this can make us feel dreadful about the day. Towards the end of the day, we don’t worry that much because we know that in a few hours we will go to sleep, which can bring some rest. It is to be noted that for some folks, their DP is the highest during the night and they may even have trouble sleeping. Fighting depersonalization can make it worse. Resisting the feelings and symptoms of DP instead of accepting them can make it worse. Excessively searching (googling) about depersonalization can make you worry about it a lot. Caffeine has the ability to increase anxiety and thus depersonalization as well. Alcohol too can have a negative effect on DP, the hangover the next day can especially increase the intensity of depersonalization. Make changes in your life and embrace a healthy daily routine. Not doing so can result in depersonalization getting worse. Do not spend your whole day indoors, try to go out even if it makes you feel afraid. In order to feel normal, you need to do the things you’d normally do.